There are a variety of reasons people carry paper notebooks in their pockets. Two of the top are for the creative types that enjoy doing a quick sketch as it comes to mind and the other is the folks in the layout group that draw ideas for sites and event plans. The creative sketching folks have been eyeballing the iPad from day one. They keep an eye on the capabilities both of the hardware and of the available apps. The concern is the effect a pen has on paper versus what a finger or stylus gets on a canvas on the iPad. Generally, the direction people have been looking is at the drawing and painting apps. 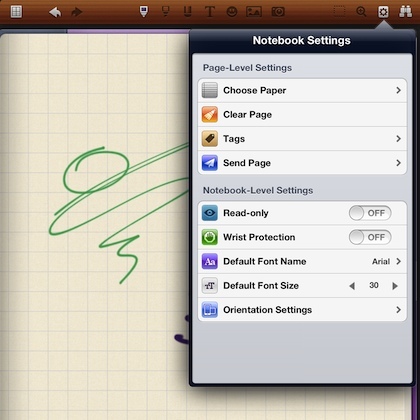 This last week, more attention has been paid to handwriting notepad apps like Noteshelf. 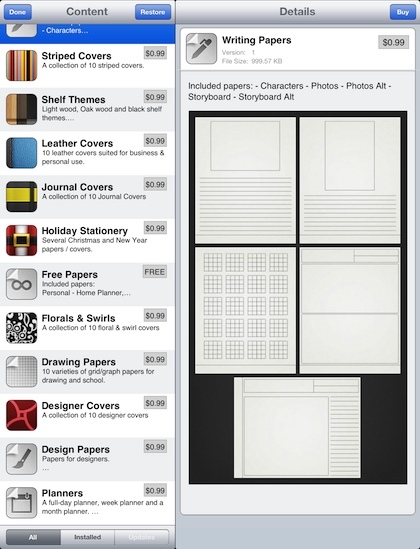 The app allows for multiple sketch books and many different kinds of ‘papers’. From quick access pulldowns is a variety of pen colors and tip thicknesses. Erasers, importing photos and placing clip art is also supported. What has shot Noteshelf to the top of the list for the creative drawing folks is the changing of the drawing lines depending on the speed and lift of the stylus/finger. The drawing area works in landscape and portrait views. When not drawing, handwritten text can be written directly on the page or via a handwriting box at the bottom of the page. The box provides for more precision writing. Typed text can also be done as needed. Tap the bottom of the page to move forward/backward through the pages of the notebook. 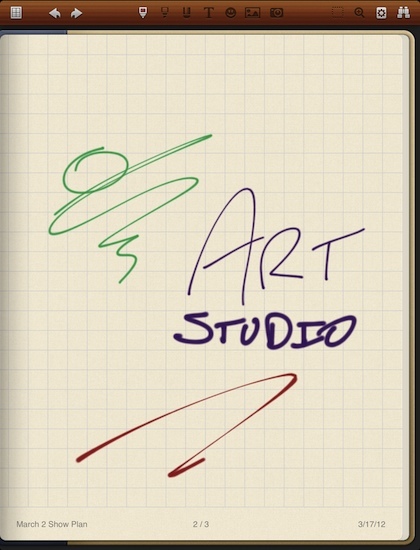 Noteshelf allows customization of the work area at any time. Choosing or changing a notebook paper type, clearing the page, adding Tags, sending the page out via email and posting to Facebook or Twitter all through a pulldown. You can also lock the document to Read Only when sharing. The Wrist Protection is handy if doing small sketch work on part of the screen where you may need to rest your hand on the screen. Sharing isn’t limited to a single page posted to social services. Instead of the ‘settings’ like icon at the top, tap the icon to the right that looks like binoculars. The screen will change to a view of all of the pages in the notebook. You can choose as many as you like export in bulk to Dropbox, Evernote, your iPad’s photo area, Print or attach to an email. 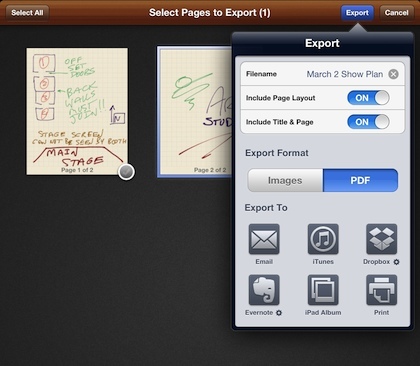 Noteshelf allows the pages to be exported as PDFs or Images of the pages. Notebooks are created on the book shelf. Covers and cover text is customizable. 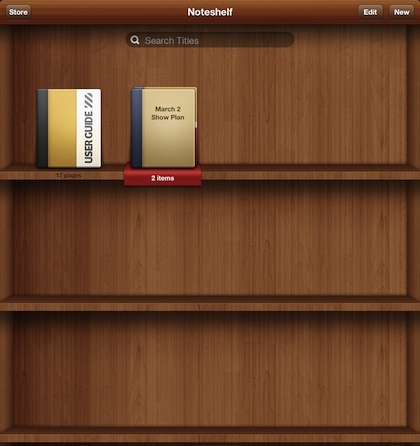 Grouping of the notebooks in Noteshelf is a feature we have note seen in other notepad apps. Just drag one book on top of another and the a group is created. Tap the group to open and access the notebooks within it. Notebooks can be added and removed as you like. If blank, lined (white/yellow) and grid paper isn’t enough, Noteshelf offers in-app purchasing of many other types of notebook covers and papers.